Before the development of dental implants, there were not many options for replacing missing teeth. Patients would have no alternative but to obtain a fixed bridge or removable denture to restore their ability to eat, speak clearly, and smile. Fortunately, dental implants are an excellent option for almost anyone who is seeking to replace missing or extracted teeth. With an overall success rate of 95% and over 40 years of clinical research to support their benefits, implants are one of the best options available for helping patients look and feel their best. Even after 20 years, the vast majority of dental implants placed by oral and maxillofacial surgeons in the United States continue to function at optimal performance. If properly cared for, dental implants can last a lifetime. How are Implants put in place? During the procedure, we will surgically place your dental implant into the jaw bone. The titanium post we use “fuses” with your bone in a process called osseointegration. That fusion is so complete that implant decay and bone loss, two possible concerns, are very rare outcomes. Most patients do not have any follow up issues. The placement of dental implants typically requires one surgical procedure. 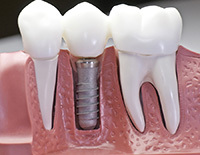 Once the implants are secured into the bone, we will attach a post, called a healing abutment. This post will not be visible when you smile or protrude into your mouth. A temporary replacement tooth will be placed on the post. In the final phase, your restorative dentist will remove the healing abutment and fabricate the artificial tooth for the dental implant. For most patients, the process is seamless and there is minimal disruption in their daily lives. With the newest advancements in implant technology, our surgeons can often place implants at the time of extraction, making the surgical process even easier for the patient. We use virtual 3D planning to place the implant using a minimally invasive procedure. With other advances in technology, materials, and treatment methods, patients who were once not considered as candidates for dental implants are now able to benefit from this technology. Schedule a consultation with one of our doctors to discuss whether dental implants is a good option for you. At that time, we will let you know if the procedure can be completed in one visit. 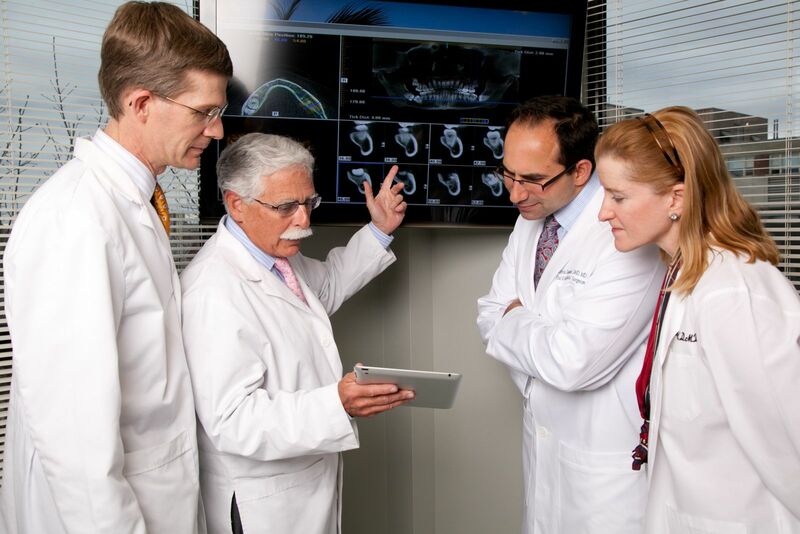 During the consultation, our doctors will review your specific case.